My kids love to play pretend. 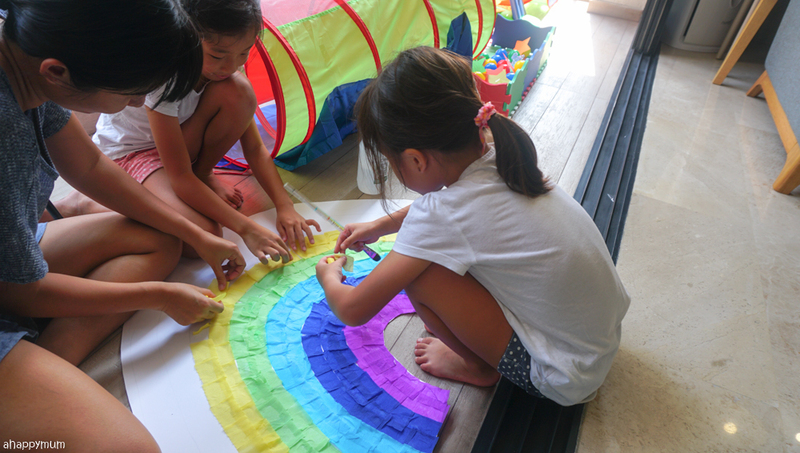 It's amazing seeing how they can come up with creative ideas, think out of the box and see infinite possibilities when given the opportunity to play imaginatively. 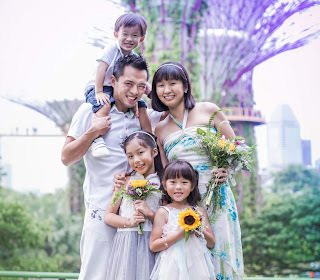 You probably know by now that we love doing arts and crafts together and I've shared many of our works in my Creativity 521 series over the years. 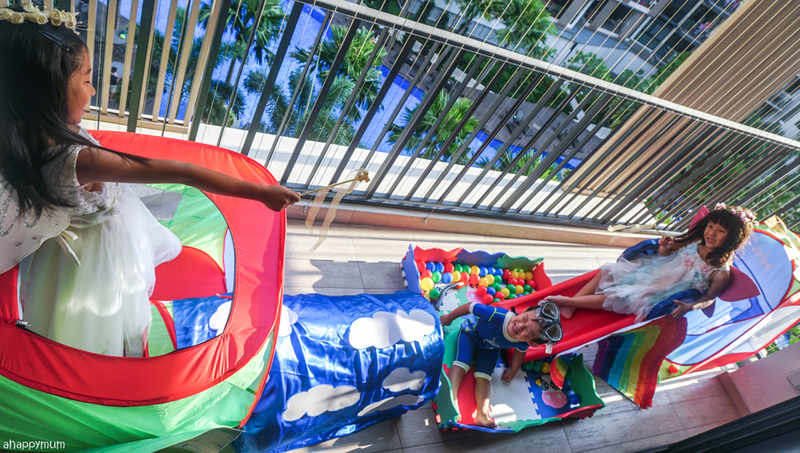 I was recently inspired to let the kids play dress up, invent their own game ideas and turned a space in our home into a whimsical playground. All it takes is imagination for magic to happen, right? 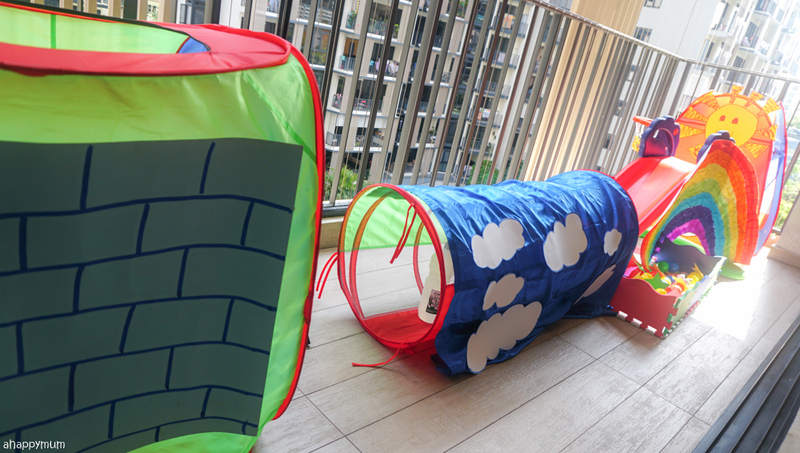 Thanks to our new playground set from Friso, we now have a play slide, play tents, play balls and play mat - and lots of room for our imagination to soar. Come join us on our magical journey as we share with you some of the wonderful places we travelled to in our imagination! The playground set didn't take us long to set up and the kids did everything themselves, except for the slide that needed a little bit of help from the hubby and I. Within 15 minutes of unboxing everything, our play area was ready! I just love the splash of colours it added to my home. The place looks so kid-friendly and inviting now. 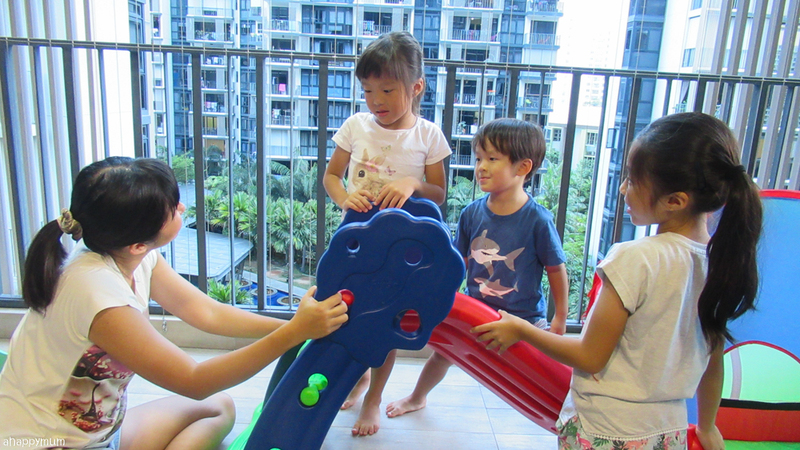 Of course, the kids are over the moon because this is the first time we have a playground in our house! 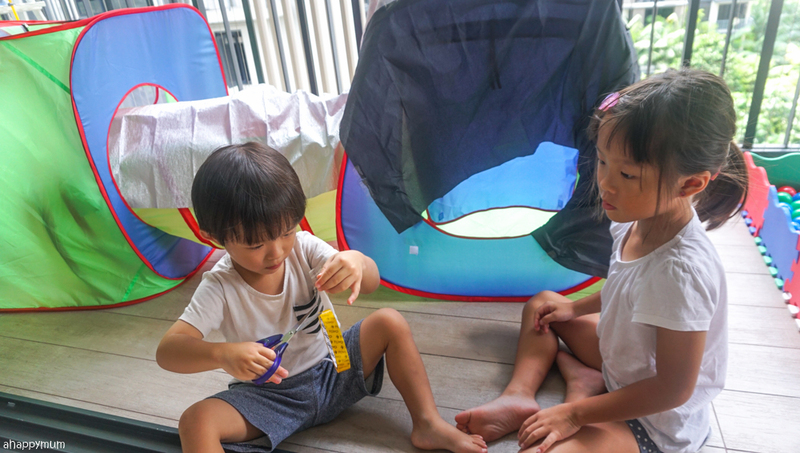 If you're worried about space, it might be good to know that the foam play mat can be easily disassembled and the tents and tunnel can be folded up to keep in a small bag. The only one that does take up space is the slide but it's our favourite of all so we will definitely make space for it. In our desire to let creativity flow, we decorated our playground set using different themes and came up with new ideas to play. Yup, mum and kids together. It's a good way for us to bond, I loved how we spent hours creating the DIY props and talking about anything under the sun, how we role-played and pretended to be anyone we wanted to be, and how we created not just a day of fun but a lifetime of memories too. 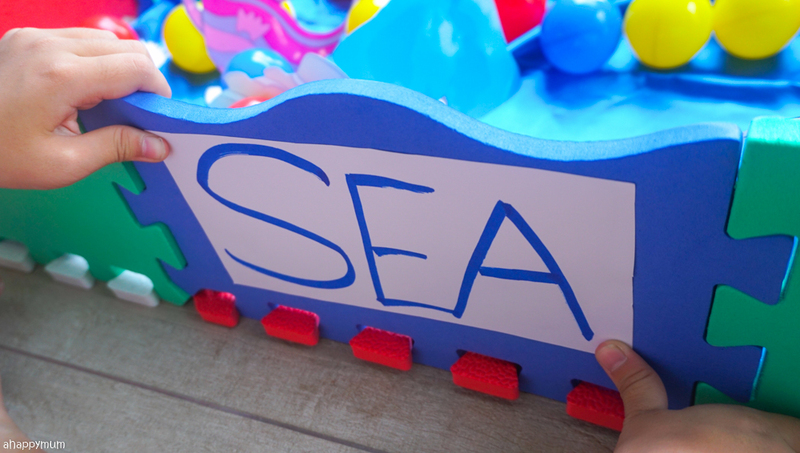 This "Under the Sea" theme was perfect for my boy who loves to splash in water, just had a visit to the aquarium, loves fishes and has a dad who works in the submarine. 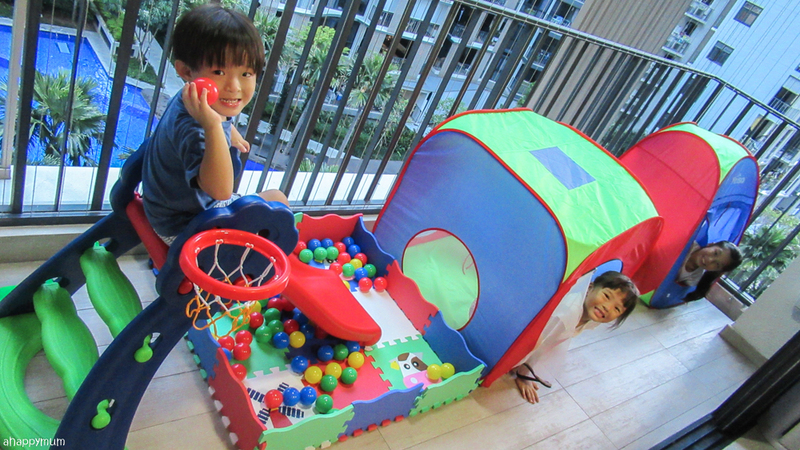 Firstly, we used a blue piece of cloth to cover the play mat and stuck cutouts of fishes onto the balls. We now had a sea of fish! 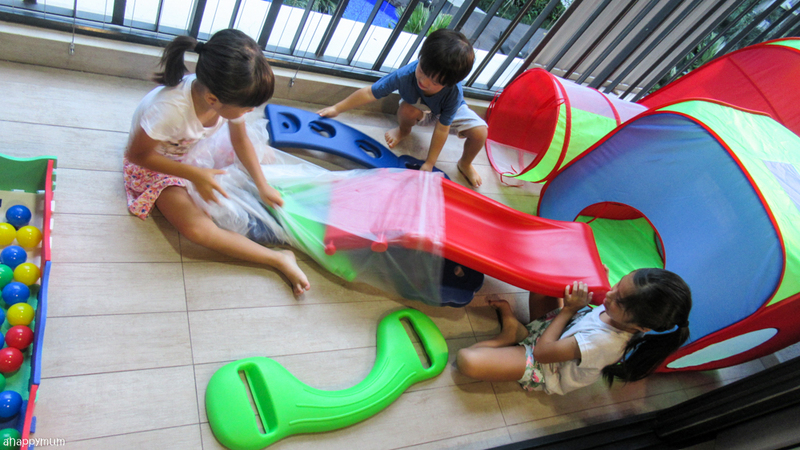 Next, we transformed the slide into a cliff and the tent and tunnel into a cave using crepe paper. It definitely sounds exciting to jump down a cliff and climb through a cave as you go on a quest under the sea, right? 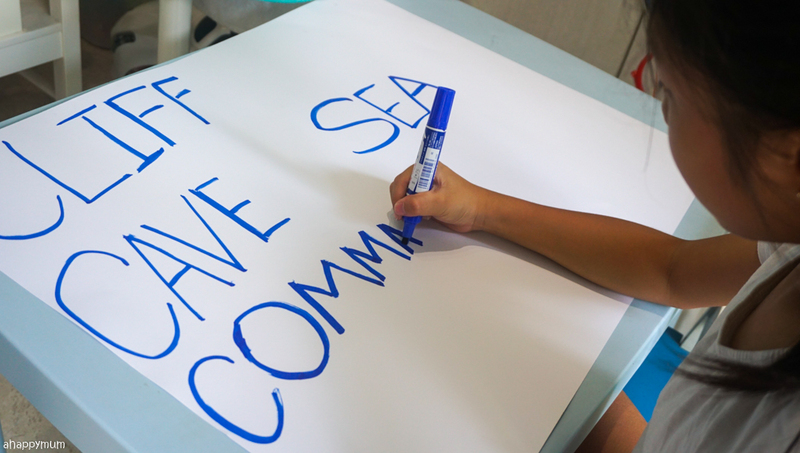 The big girl used a marker to write down the names of places - Cliff, Cave, Sea and Commanding Station - on a piece of vanguard sheet. She then cut them out so that we could label the places accordingly. 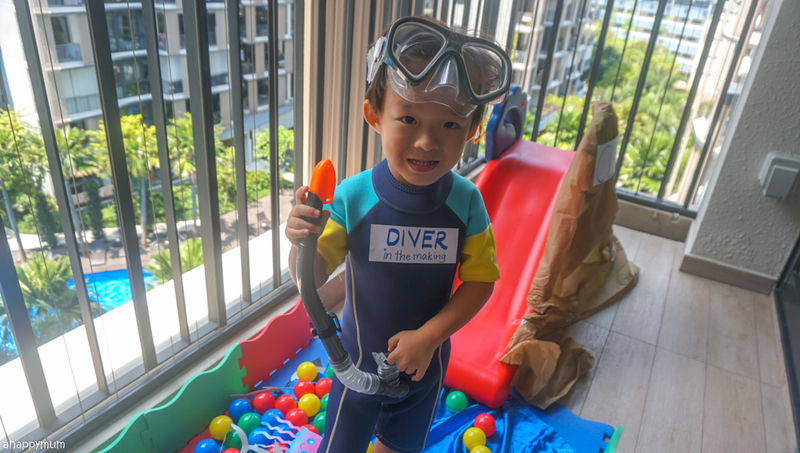 Costume: Now, it was time for our little diver to get into action! See how mighty pleased he was with his new snorkel mask? He could hardly wait to start! 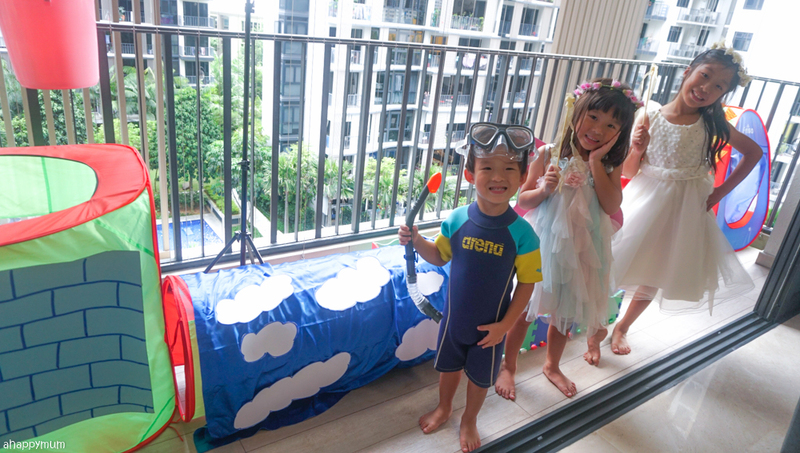 He was dressed up in his swimming suit which had a label that says "DIVER in the making". 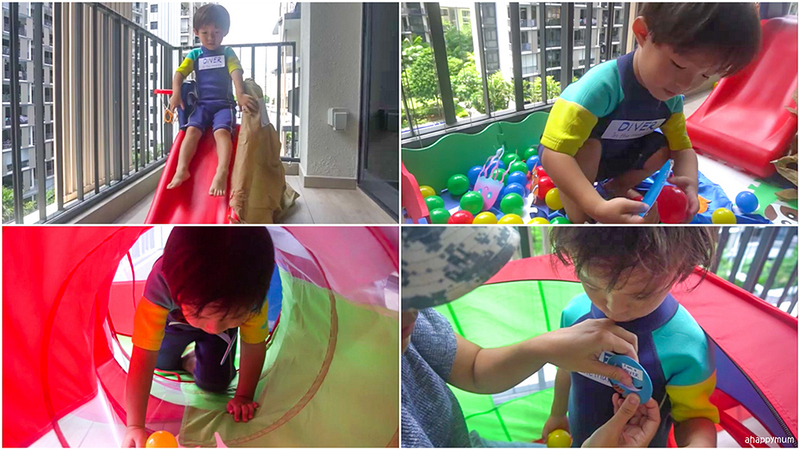 Game play: The three-year-old is training to be a diver but he has to first climb up a cliff and dive into the ocean. Then, he has to retrieve the fishes according to instructions and head across the cave to pass the correct one to his commanding officer - that's me. When his mission is accomplished, I present him with a diver's badge and give him a congratulatory hug. See our video below for how it went and don't miss that big smile on his face at the end! As for the sisters, they have always been in love with fairies, tiaras and rainbows so I couldn't have thought of a better theme for them than "Fantasy Land". I was surprised to see that the nine-year-old was the most excited one, and she came up with many of the amazing ideas too. I loved seeing how their faces lit up whenever they had a chance to be creative, and it felt as if we could achieve the impossible if only we let our imagination take us far. To create the sky where our fairies would live in, the big sister drew clouds on a white vanguard sheet and cut them out along the outline. 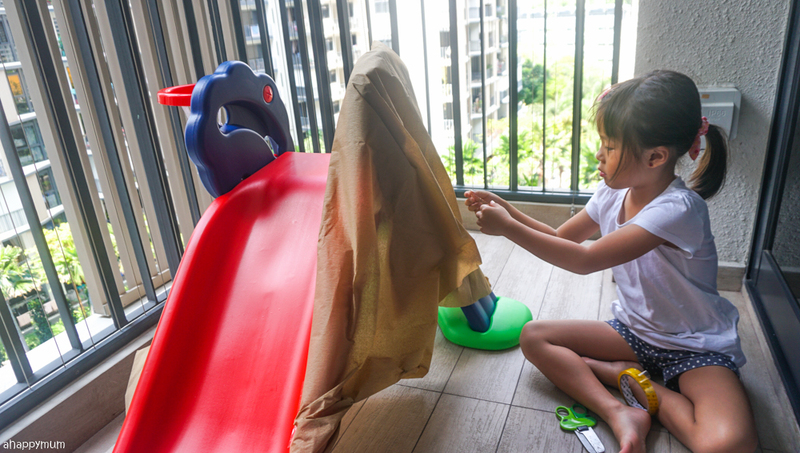 She draped a piece of blue cloth over the play tunnel, and applied the cutouts. We now had a beautiful blue sky with fluffy clouds. 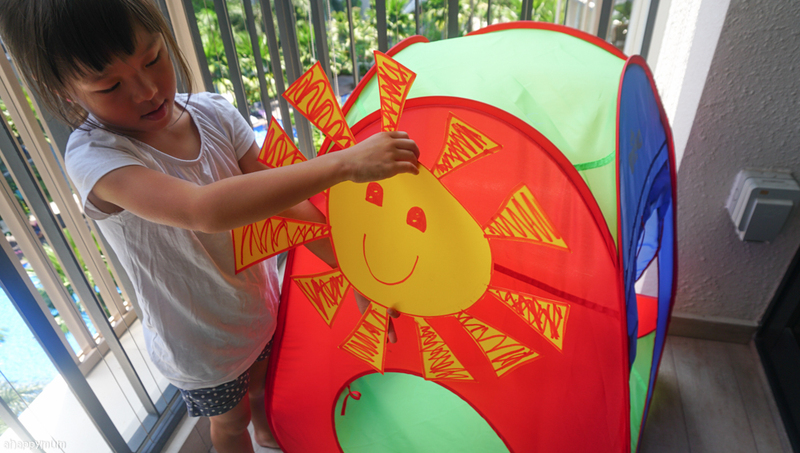 The little sister helped to draw a sun, and she was the one that requested to draw in the smiling face and even added highlights in the eyes too. This was then cut out and stuck onto the play tunnel which was going to be the home for the fairies. 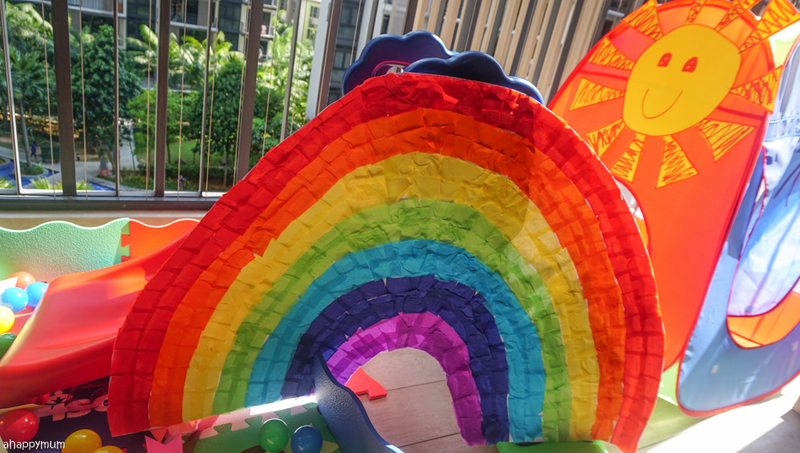 Next, we did the hardest but most fun DIY prop of all - the RAINBOW! We created this by sticking two white vanguards sheets together with one overlapping the other, cutting it into an inverted U-shape and then forming seven lanes which we filled with the different colours. 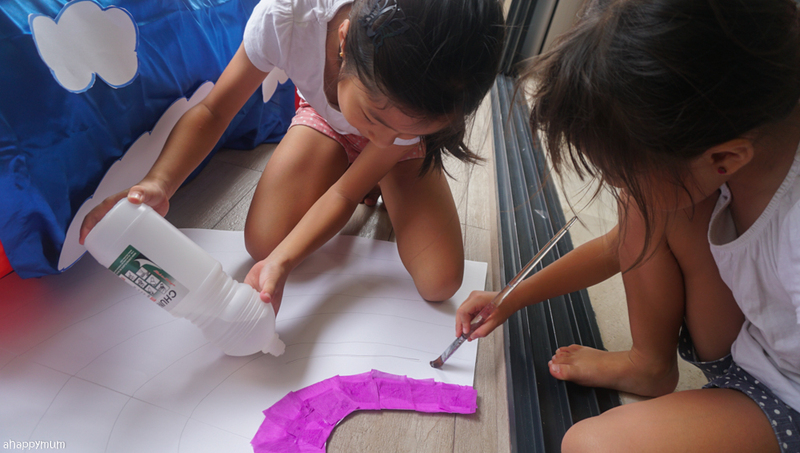 We cut out small pieces of crepe paper according to the colour sequence, used a paintbrush to apply glue on the base and then stuck the paper over it one by one. Yup, it was really fun to do and I loved this opportunity to get to craft with the girls once again. They were very proud of the end result. 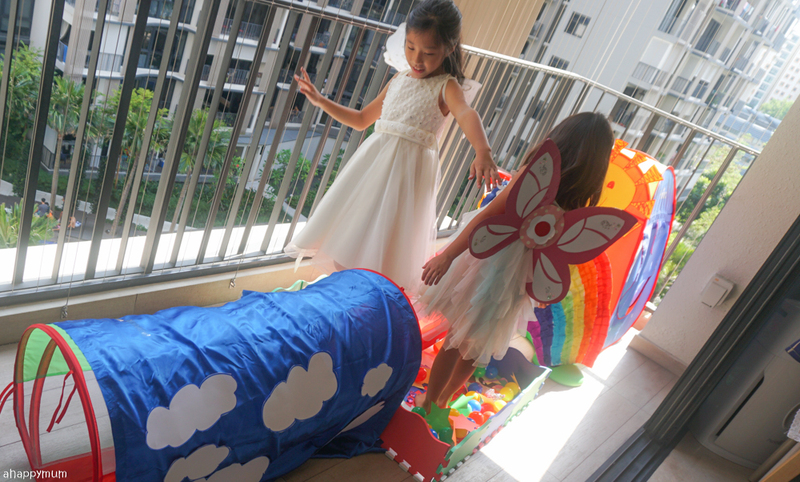 I think it looked gorgeous and transformed our play slide into something magical. We also turned the play mat into a galaxy of stars by pasting star cutouts onto the balls. Magical ribbons were hidden among the stars which we used in our pretend play later on. 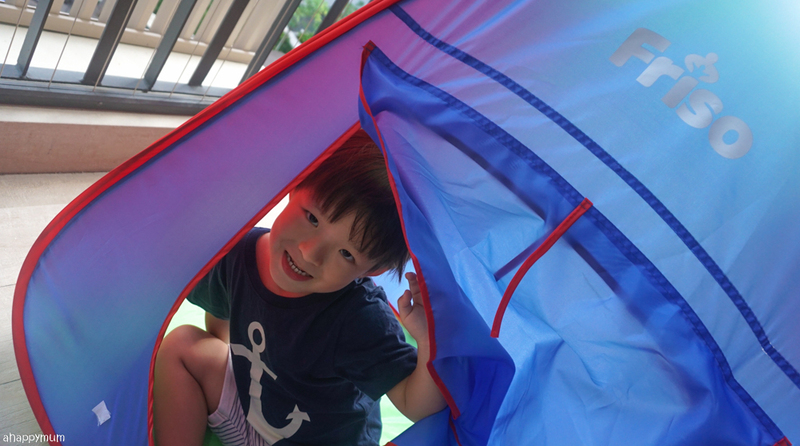 As for our last prop, one of the play tents became a magical well. We created this by drawing a brick design onto a piece of vanguard sheet and hanging a bucket overhead by using a backdrop stand. 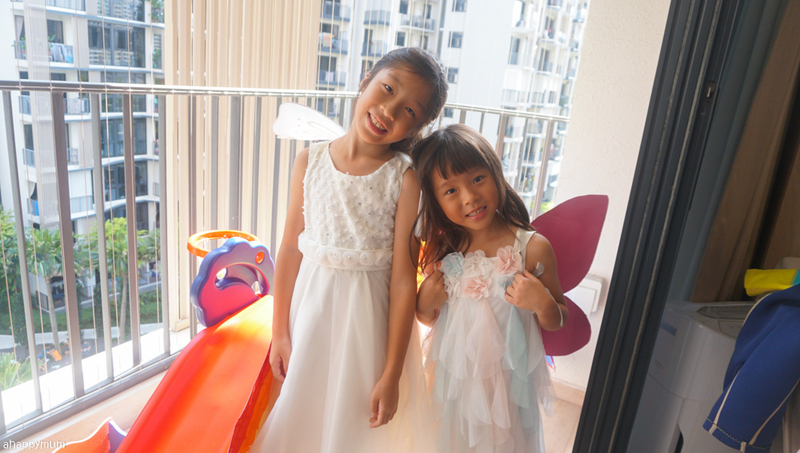 Costume: The girls became fairies by putting on their beautiful gowns and wings! We did the pink wings from scratch using cardboard from before (you can see how we did them here). But where are their wands (made using balloon sticks and ribbons) and flower crowns (this is how we DIY-ed ours using floral wire and artificial flowers previously)? Read on and you'll understand! 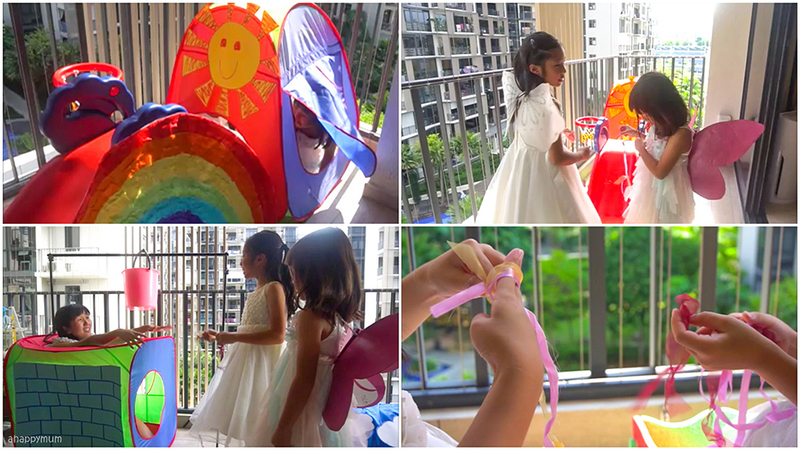 Game Play: Together, we came up with a script and storyline for pretend play in our Fantasy Land. The girls are the fairy sisters who live in the sun and one day, they hear someone crying for help and spot a lady trapped in a magical well - yeah, I am the damsel in distress. They scurry to save her by climbing over a rainbow and entering a galaxy of stars where they have to fish out the magical ribbons and tie them together. Once their magical "rope" is done, they fly across the clouds and help to pull the damsel out of the well. She turns out to be their fairy godmother who had set up this test to determine if the fairies have kind hearts and eventually she bestows them with their magic wands and crowns. How fun, right? We shared so much joy and laughter during the whole process and I knew this day would leave behind many precious memories for us. It also reminded us that as long as we hold onto the power of imagination, we can go to any place we want, do anything we like and, in a way, make our dreams come true. 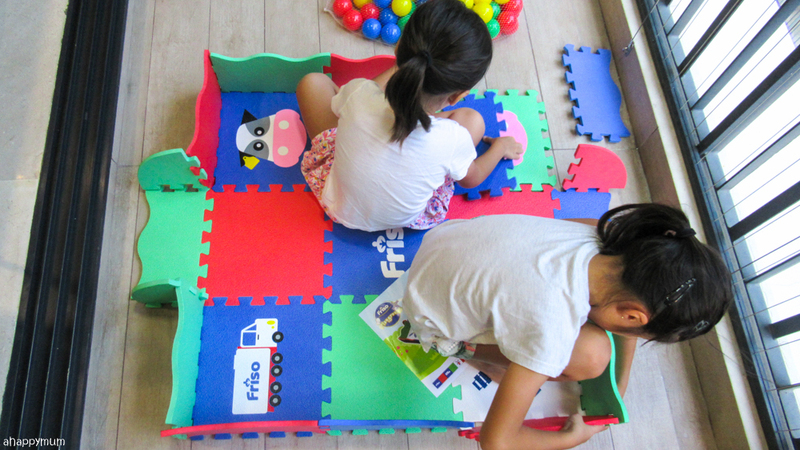 We can't wait for our next imaginary play session! 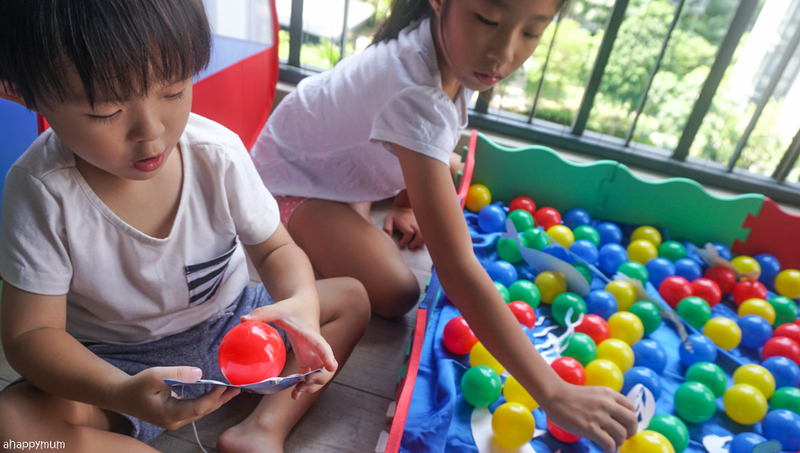 Don't forget to get your Friso playground set today and join us in letting those creative juices flow as we enjoy precious bonding time with our little ones. 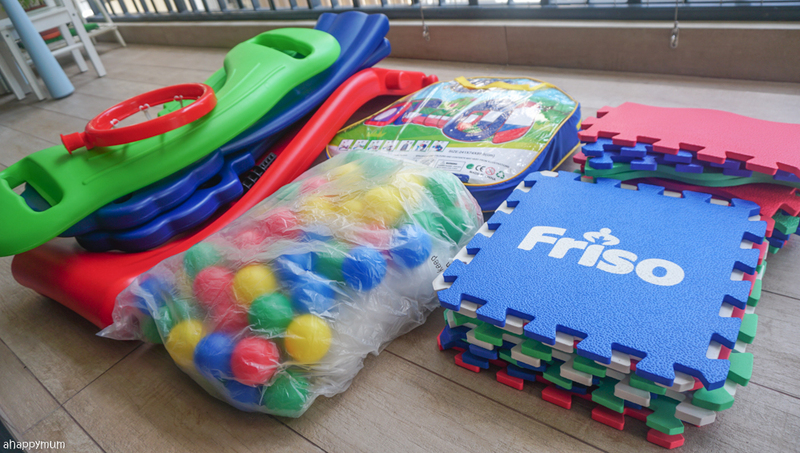 From now to 30 April, you can get your Friso playground set for FREE with every $380 purchase of Friso products*. Yes, sounds awesome, right? I have a feeling your kids will love this too. Redemption details can be found at https://www.friso.com.sg/thebestplayground. For terms and conditions, go here. 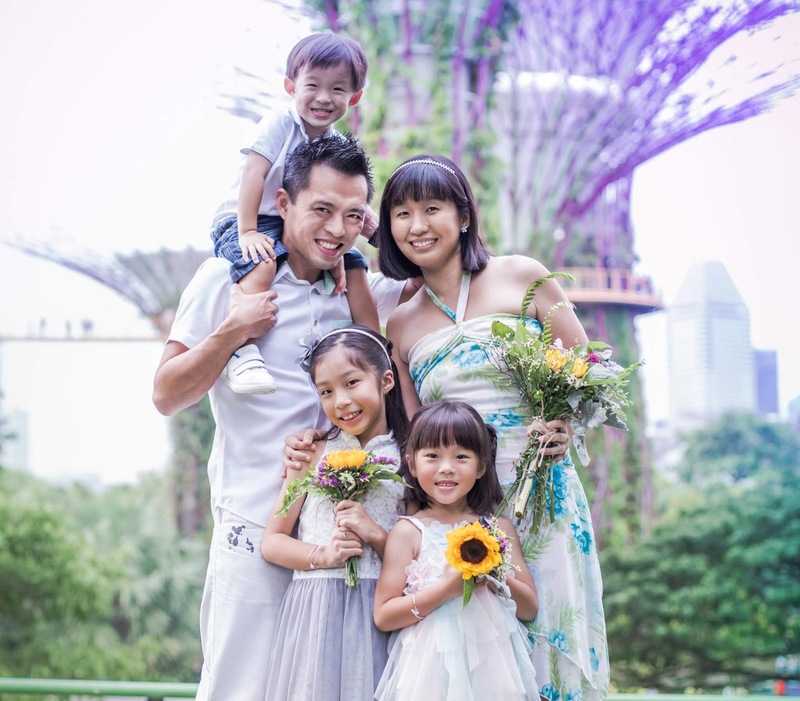 This article also appeared in theAsianparent. Disclosure: This is a sponsored collaboration between Friso and A Happy Mum. All images are my own unless stated otherwise. All opinions are mine.